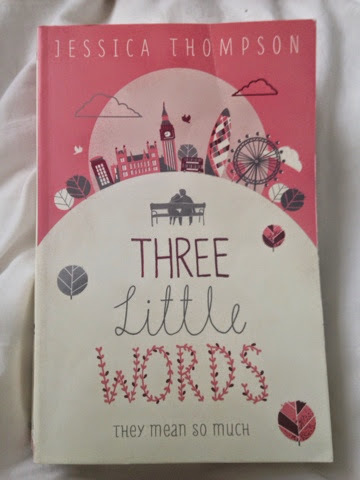 Three Little Words- a book about love. Oh how first impressions can be deceiving. The front cover and title arise expectations of some soppy love story full of unspoken feelings and racing hearts. But this book is not at all like that. Yes, it is a book about love but ultimately it is a book about forgiveness and pain, with an ending that makes you wonder whether 'I love you' really are those three words the title hints at. Ultimately 'I forgive you' can mean more than a declaration of love. The story is an interwoven tale of four women whose lives are all altered on one fateful night. It is a tale of their journey to forgive and set free daemons that hang over them. The story is centered around Bryony, happy in love, her life is changed beyond belief by that night. Then there is Rachel who is a thriving ballet dancer, struggling to cement her identity until she finds something out that causes her to question her entire life. There is Sara who believes she is happily married until she uncovers something that puts her marriage into uncertainty. Finally there is Tynice who is struggling to forgive her son after a dreadful incident. The reader follows the lives of these women as they struggle to come to terms with their circumstances and as they learn that their forgiveness may well be the release from it. At first I was overwhelmed with the number of character who attempted to take centre stage. But once I got my head around it they fell into place nicely. I was further confused by the jumping around of dates, each chapter followed a different character and the dates weren't always sequential. This was a minor issue, but on top of the long line of characters, it was just another aspect that confused me. I felt that Sara and Toms story line did nothing for the plot and equally Rachel's had no real significance to the central story line. Although both Sara and Rachel had a brief relevance to Bryonys story line, I didn't feel like it was enough to justify their large role in the book. Part of me wishes that the book had focused on just Bryony as I would have liked to have got to know her a bit more. I also liked Tynice who I felt was a really raw character torn between loyalty, guilt and shame. I had previously read This Is A Love Story which I now know was likened to One Day. Sadly I don't think any of Jesscia's books quite stand up to One Day, although One Day holds a special place in my heart that any other book would struggle to compete for. This was a brilliant book that fought to stay away from Chick Lit stereotype and succeeded. There was a brilliant balance of love, forgiveness as well as a hint of crime that gave the book a twist that puts it a step ahead of your average Chick Lit. I only wish someone had thought more about the cover, given it a bit of edge, it is a book I would have easily walked by and not given a second thought. Overall I really did enjoy it! It was a quick read and there were some really good characters. I look forward to starting Paper Swans.